I KNEW she wouldn't leave me high and dry!! Okay, I've perked up now that I know that the Patterson family is going back in time, with Lynne drawing again, new stories but this time without time progression. I will be the family when Elizabeth and Michael were the only two kids. I will miss the aging that she previously allowed her characters but this is better than stopping cold turkey!! Thank you, oh THANK YOU, Lynne Johnston! A couple of weeks ago I drew and sent the last two weeks of dailies, bringing to a close the main storyline of FBorFW. It sure wasn't easy! I think the drawings were harder to do than the writing, because I'd been thinking about what to say and how to say it for a long time. I had that "running in a dream" feeling, as though I'd never get there, but once the deed was done, I felt strangely comforted; a feeling that I'd done the right thing at the right time. For the past 7 years or so I was aware that the stories were becoming more complicated, the drawings more controlled and the characters more realistic. Gone was the loose, funny, free-hand line I had started with. As the adventures of the characters became more defined, so did the drawing, until I researched everything, from forklifts to faces, from aircraft to arcades. I was out for accuracy. Every house, every apartment had a floorplan. The furniture and the color schemes had to be consistent- as did the information I gave about the "players", and if I made an error, you would let me know! I have always been impressed by the fast response that comes when an error has been made, or if the story has a twist to it that doesn't go down well! Readers catch the minutest of details and I'm always grateful for a correction or a reminder!! One thing I was often asked was to tell more about folks such as Anthony's parents, but there were so many characters...and only one statement a day (less than 30 seconds) to try and tell a story, I just hoped you would make up your own minds as to how these distant players fit in!! With that said, I have now let all of this pass into the mist as the story ends and I return to the beginning. For Better or For Worse begins again on September the 1st with new material, new art and new enthusiasm! Without the need to visit all of the auxiliary characters, I can concentrate once again on the insular little Patterson household. I have the children all to myself again. I can do spot gags and silly stuff. I can fix what I don't like about my early work as I add and subtract...redraw and just improve everything. The crazy part is drawing the way I used to draw!! I practised, using the first two books, copying as if I was trying to draw someone else's work, not my own! It's taken some time to simulate the earlier work, but it's coming and because it's a simpler style with less detail in the background, I can comfortably do all the art myself without the need for another illustrator. This makes the process faster and because I'll be including some of the classics, I'll be able to take some much needed time off! I expected to find a return to my old style of drawing a bit stressful, but it's been easy! I also expected to find it hard to rip into the belief that I was a young mom again with two small kids...but this is really fun!!! I'm so enjoying the loose style, the freedom to play with the younger Pattersons again and the less complicated cast of characters. Mixing the classic and new strips, is both challenging and rewarding as I improve the work I started with. Who gets to do this??? I consider it a real privilege to be able to work on the beginning again and I hope you'll enjoy what I do. One way or another you'll let me know - and I look forward to hearing from you. Well, Elizabeth and Anthony finally got married. Her grandfather had a heart attack and is frail but doing well. John and Elly moved into a smaller house and sold theirs to Michael and Deanna who, with Meredith and Robin, needed more space after their apartment burned down. And today, the final farewell was said, the final strip was published, the story is completed. I am so sad. I feel like I have lost a friend. Elly has been my "neighbor" for over 30 years. I find it hard to think that there will be no new stories, no more developments, we'll never know who April marries. And how will Anthony's daughter do with Elizabeth as her stepmother? Will Anthony and Elizabeth have children and if so, how many? So I say a FOND farewell to the Patterson family. I will miss you. Oh how I will miss you, my friends. Today is my one year "blogoversary" (haven't seen THAT Hallmark card...yet!) I'm not exactly sure what the protocol is for celebrating that or if there even IS one. But I will mark it with some fantastic news of my own. Truth is, I've always been a "larger than life" kinda girl in a LOT of ways - personality, volume of voice, enthusiasm...and, oh yeah, physique. Well, due to a little adverse reaction to a medication last January, I had the not-so-pleasant experience of a-fib. Nothing like waking up at 2am and realizing that your heart is waltzing when it should be doing the 2-step. Surreal to say the least. So moi now has to remember to list under "drug allergies" something to the effect that just about any drug that ends in "ol" is not good for me. Albuterol. Salbuterol. It makes my heart skip a beat, every other time. And Mike's not even in the equation. Odd, I can take Tylenol. Needless to say, it was a bit of a wake-up call for me. I figured I'd been pushing my luck for years and it was time to get serious about not "pushing the envelope" on my health anymore. So I devised my own plan of "Cheri's Rehabilitation For Longevity of Life and Pursuit of Happiness with Husband, Children and Lovely Grandchildren" diet. It's not ever gonna make the bestsellers. The name alone is enough to make most people pass it up. But, being the "emotional eater" I am, I had to devise a way to be able to eat that wouldn't put me in an early grave nor in two seats on an airplane, whichever came first. There is less of me to love. But hopefully for longer. Anyway, we finally finished on Monday evening. There are 10 bags of trash for Chris to go put out tonight for the trash man tomorrow. There are two Rubbermaid trash cans full of wood for Jason and Chris to pick through and get what they want, disposing of the rest. And there is one large moving box full of chemicals, pesticides and aerosol paints to take to the city specialty waste department by Chris. But all in all, the house is empty, repainted (not by us! ), re-light fixtured (yes, by us and is that really a word?) and ready for a full-out clean by a specialty company so it can be put on the market hopefully this weekend. It was VERY satisfying to drive away at 8:30pm Monday night knowing it was DONE! I should have taken pictures but we were so tired after that "final push day" that I didn't even think about it. So now we are home and I'm sorting through the minutiae of my own life - mail, bills, paper sorting, submitting medical claims, laundry, buying groceries, going to the laundry with shirts and getting back to "normal" (ha, that's a laugh...). It was an unexpected way to spend what I thought would be a two week visit with 3 of my 5 grands and 4 of my 6 children. But I'm glad we were able to help and even more glad that we were clearing for a MOVE and not a DEATH as is so often the case. It's much easier going through all the household items knowing they were just across the city in a new place instead of trying to sort through the house while sorting though grief. And now it's done and they can get on with their "new normal". We've moved so many times that I can do it almost in my sleep. But their last move was 23 years ago so it will take awhile for them to get on their new "auto-pilot" and not have to think about how to drive places and where something is in the new place. Gotta go get the dogs now - they've been in their "unfortunate incarceration" at the kennel since July 23rd. I'm not going to win the "Doggie Momma of the Year" award for sure and wonder if I'll be brought up on "dog abandonment charges". They'll probably hate to leave the place as they get to wander out on ranch acreage, swim in a "lake", play with the other "inmates" and Shelby, who is a favorite of the owner (Denise) usually gets to ride on errands to the Post Office and bank! I'm sure they'll be bored once they get over the astonishment that NO I HAVE NOT ABANDONED THEM! 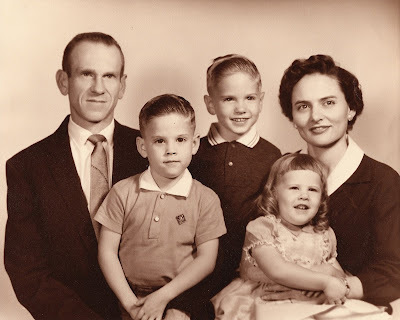 I hope to post some more photos of "way back when" of Mike's family. And I hope to post more often. You must understand something about my Mike. He's not an overly demonstrative man. By that I mean that he is "tastefully understated" as far as mushy cards, overkill on PDA, massive gifting sort of things go. Don't get me wrong - he's very affectionate and knows how to subtly convey that. His cards are to the point and lets the card convey the message. He's an avid hand holder. And through the years, I've learned to read the nuances of his expressions so well that, were I a poker player, I could beat him just by reading his expressions. So when he does "grand gestures", he REALLY does GRAND gestures! The Christmas after we moved back to the States, I didn't expect anything seeing as how we had bought 2 cars, built a GORGEOUS house, had to get a full complement of appliances - all those "hemorrhaging money" things one must do after living overseas for an extended period and setting up house in the US of A once again. So the last thing I expected was what I got. First I opened the well-hidden tell-tale robin egg blue box tied with a white ribbon bow to find a GORGEOUS Tiffany diamond ring. Then I opened the card and started crying. Jennifer, knowing Mike's brevity, said, "Did he WRITE in it this time??" Oh, he had! You're a good man, Charlie Brown. Thank you. And I love you. I was reading Emily's blog about how her two year old pipes up about traffic. I admit, I was thinking, "Yeah. Right." Then today, as we were driving around Southlake (Jennifer riding shotgun, myself driving and the boys in the back), I missed the left turn arrow and had to pause for traffic to break so I could execute my left turn. The sign over the light said "Yield to traffic on green" or something to that effect. "Go Gramma! Go!! The light is GREEN!!" says Ben. Jennifer and I look at each other...then we burst out laughing. "What's so funny? It IS green!" comes the voice from the backseat. 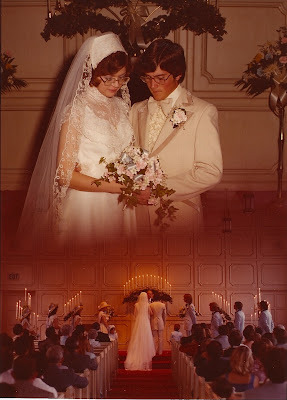 Thirty two years ago, I signed on "for better or for worse" in marriage to Mike. Which of course makes today our anniversary. And as usual, we are in two different places geographically. Mike is in Alaska and I'm in Keller. Such things used to distress me, but as time rolls on and we grow in our relationship, I know the important thing is that we still have each other. The doing something big "on the day" is really secondary. I started learning this early on - Mike was the "new hire" at Amoco and ended up on a rig in Brazoria County on our first anniversary. Oh, the bitter tears I cried when I found out he'd been "one-upped" by someone who had been there longer, had more seniority and bumped Mike to be on that rig that particular day. Well, it was worse than just a day - he was on that rig for 3 or 4 days and nights. At the time, I thought surely it MUST be over! Surely our marriage and the celebration thereof HAD to be "on the day" and earning a livelihood, with a regular paycheck took a back seat! SURELY!! And to top it off, my mascara ran and permanently stained the bedspread I threw myself on dramatically when I got the news on the phone a few days earlier. It was an Oscar winning performace. Oh, how naive was I. It may not sound like the most romantic of ideas, but through the years I have indeed learned that a special occasion is not besmirched or denigrated by having it early or delaying it till later. The important thing to remember is the REASON for the occasion and the people/person behind it. And of course that reason is the love and mutual admiration we have for each other. We are each other's best friend as well as Chief Friend (which is why we often sign cards and emails "Love, CF"). It's not been all sweetness and light, no sir-ee. I'd be lying if I said it was. On our 25th anniversary I joked that we'd been happily married for 23 years! But it has been a roller coaster ride to rival any one built by man! Fantastic highs and scary lows. Dips and turns. Soaring and sailing. Exhilarating! 1. Got married while Mike was still in university. I was 19 and he had just turned 21 before the wedding. And Mike mentioned the "M" word after we'd been dating, oh, six weeks! Then proceed to ask me to NOT say anything to anyone about it "until the time was right". 2. Had our first child 18 months after the wedding. 3. Moved from Lubbock to Bay City to Houston to Chicago to London to Norway to New Orleans to Houston to Chicago to Houston to Trinidad to England and back to Houston where we plan to stay for awhile. 4. Have owned 9 houses. Made money on only 4 of them. 6. Had premature twins in England. Survived the loss of one. 7. My dad was one of Mike's professors at Texas Tech. Neither of us realized that for quite some time. 8. Only once conceived a child in the same town as delivery. Jennifer and Timothy were mid-pregnancy transfers necessitating finding new doctors and hospitals in the new location. 9. Flown more international long haul flights than I can remember. 10. I learned the Queen's English and Mike learned Norwegian. 11. Have been members of seven different congregations, some of them twice (one of them three times...) Mike has been a deacon three times (Katy, Chicago and again at Katy now) and an elder once (in London). 12. Stateside, there is only one school that all three of our children attended at one time or the other. 13. As Mike's wife, tradition dictated that I name one of Amoco's gas fields in Trinidad & Tobago which I did. I named it Amherstia after one of the most beautiful flowering trees in the Caribbean. 14. We have owned 15 cars. 15. We have had 5 dogs and 2 cats. We have had animals in quarantine for 6 months twice (Trinidad and England). Our dog had a UK pet passport. 16. We have either helped with or paid for three weddings. 17. We have been blessed with 5 grandchildren - two in 2004 and three in 2007. 18. We have been to Wimbledon. 20. We have the perfect relationship - he earns the money and I spend it. He eats the food and I gain the weight. We had no idea our journey would take us to all the places, geographical and emotionally, it has. We have been both wise and foolish. We have been forgiving and begrudging. We have been loving and sometimes ugly. But through it all, we have looked beyond ourselves, seeking wisdom from above, trusting that come what may, if we put God first, the rest will "fall in place". We don't have all the answers and we don't claim to. But we have each other and a loving God to guide us. So we have DIRECTION! As previously mentioned, I've been going through my in-laws home to clear it out in preparation for selling it. They have moved into a retirement community and (hopefully) have all their dear treasures with them there. It's the rest of the "stuff" we gather in life that has to be sorted through. We moved them in two weeks ago. On Friday, I finished the last room "sort through" and on Saturday, furnishings were moved to new homes within the family. Painters have started the work of removing wallpaper, texturizing walls, painting, etc. I've bought new light fixtures for the bathrooms, dining room, hallways and fans. There is still much to do. Mike arrived from Kazahkstan on Thursday and he, along with our children, has been organizing the gargantuan task of clearing out the garage and workshop. I can help there to a certain extent but, not being a "shop" kinda girl, I don't know what equipment goes with which machine and all that jazz. Now Mike has had to leave to go to Alaska for the week. So I'm feeling the pressure to complete my interior tasks. Like getting bids to have the house deep cleaned - windows both interior and exterior, getting the new fixtures installed, getting services canceled in stages (cable TV, phone and internet can be disconnected now; water, electricity and gardening services must continue until the property is sold and they've closed). Mike and Chris used Chris' pickup to take table saws and other shop equipment of unknown species over to our daughter's house (enjoy, Jason!) on Sunday. I have just about hit the wall. I need a shower, a good HGTV program, comfort food and about 8 hours of uninterrupted sleep. I don't mean to "winge" as the Brits say. Mike's folks are getting on in years, have lived in this house for 23 years and need every bit of help they can get to make this transition to a much smaller but hopefully easier to maintain housing situation. And I'm glad to help. After all, they DID produce this lovely man to which I will have been married to 32 years as of tomorrow! And let's face it, WHO in the family has more moving experience? I could do this stuff in my sleep! It's just more difficult to go through someone ELSE'S things and make determinations of what is important and what can be tossed. What is an important memory (before "my time" which would be about 1975) and what is just something thrown in a drawer and of little importance? 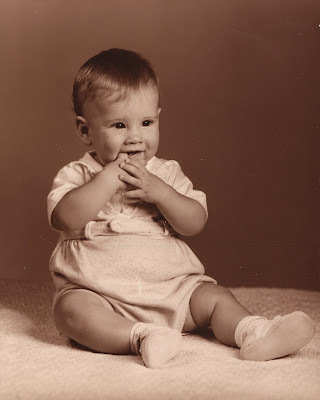 I've "discovered" photographs I never knew existed - especially ones of Mike when he was a baby (and boy, was he CUTE!!) 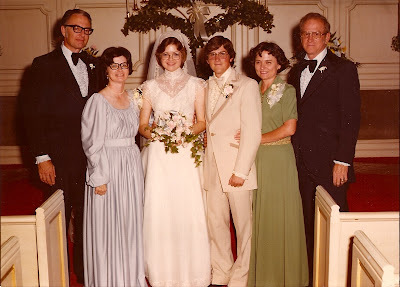 I'm in the process of sorting through years of photos, dividing them by families (the original family and then the three children married until now) and non-family photos. I have good intentions to get them put into albums eventually. I hope I have made good decisions. I hope I haven't messed things up. And I hope they feel comfortable in their new home very soon. The last day or two I've just done "stuff" around the house here, running errands, paying bills, catching up on news and blogs. I hope the break will give me fresh perspective and energy as the week continues and I get back into "get it sold" mode. Jennifer joked that we should call HGTV and get on "Designed to Sell"! Sounded like a good idea to me! I've been going through my husband's parent's house the past 13 days. They moved into a retirement community, going from a 3 bedroom, 2 bath house they built in 1985 into a 2 bedroom, 2 bath apartment. Major downsizing. Cindy, my SIL, and I have been plowing through closets, pulling boxes from underneath beds, going through a ton of papers and finding trash and treasure on the way. Some of the things we found that we didn't know (or had forgotten) existed were some photographs. Lots of photographs actually. I've scanned three of my favorites (so far) and am sharing with you. I find it interesting that this type of photography is now "in vogue" - perhaps it's a throwback to memories we have of what we feel is a "safer" time, when men wore suits not only to work but also to church services. When moms wore dresses when in public. When the holidays were a time to go get new clothing and get a photo made. When we ate Wonder Bread with peanut butter and jelly, brought to school in that new, metal lunchbox with Barbie or Huckleberry Hound on it. The first photo is of my mother-in-law, Peggy. I think it must have been taken around 1950-1952. It might have been taken a little later as Mike wasn't born till 1955 and they married in 1953. Isn't she a knock-out? 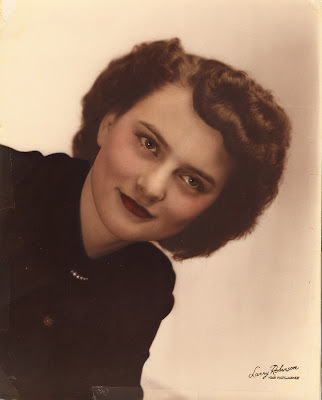 We've found several photos of her, both professionally done and square photos taken on a Kodak Brownie camera. They are all good! 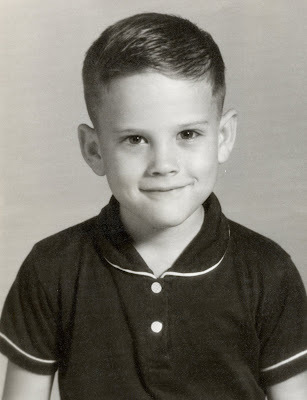 The third photo is of Mike when he was a few months old so must have been taken around Christmas 1955 or early in 1956. I see a lot of Mirai (our youngest granddaughter) in that face - the eyes especially. But I love these photos and hope you enjoy them too. I may share more of them in the days to come as I delve into the boxes of photos I will attempt to organize for them. It's been interesting going into the history of the family in which I am now a part. Here thinking of you, Megan! I have helped with my fair share of wedding planning. I've DONE a lot of wedding planning. There are books GALORE that tell you what you need to do, what is traditional, expected, "the polite thing to do". And one of the "new fangled idears" that has become stock in wedding planning is SOME form of "Save the Date" announcement. I've seen magnets for your fridge, nice cards with beautiful artwork you WANT to display - all with the intention of making sure you KNOW you will be invited, you WILL keep that date open and of course, you SHOULD be thinking about the gift-ola!! Well, today I found THIS and am still chuckling (that's what over-50's do - we don't "ROFL" - we "chuckle"...) This takes the cake for the MOST original 'save the date' announcement I have EVER (and may ever) see. This couple are obviously in California in the movie industry. Kudos to them for their imaginative approach. I was thoroughly entertained and wish I could have been one of the lucky ones invited to THEIR wedding. When the kids were young, living at home young, I used to joke that my house was "tidy" but not necessarily "clean". I've always been a big one for things in their place, organization, etc. but as long as walking on the floors didn't leave a "clean wake", I wasn't overly concerned with how "clean" it was. Bathrooms might have been done every two weeks - if I hired someone to do them (which I often did). Growing up, my mom had a picture hanging in the kitchen that said, "My house is dirty enough to be happy, clean enough to be healthy" or something along those lines. Well, finally, proof that this is true. I KNEW it!! When Jenny was a baby, I asked her doctor when I should stop sterilizing her baby bottles (we did not have a dishwasher). His reply? "Is she crawling enough to chew on her daddy's shoes?" which she was, and had indeed done once by then. "Then stop." Now, I'm not saying set your purse on your kitchen counter - especially after it's been sitting on that nasty public bathroom floor (sans any hook on the door I might add) while helping my 3 year old grandson. But a bit of dirt evidently IS good for you! I was reading bits and pieces of news online tonight when I read this article. Astounding. Absolutely astounding. How on earth can you "forget" your 4 year old on a flight? Today you are 53. Nothing like the cold slap of reality on your big day is there? And you are not even home but in Kazakhstan! What do they have that I don't? Oh yeah, YOU!! I miss you, babe. I have had one of those weeks that makes you tired just READING about it! We were in Keller last Sunday and left for Katy with Jen and the boys that afternoon. Fairly uneventful trip considering we were driving in the heat of the summer, with a 14 month old, a 3-1/2 year old (or "3 and three-quarters" as Ben would say) in a car filled to the brim with our luggage and baby things being brought back for a dear friend of mine who has become a grandmother and needs her "gramma room" stuff. Anyway, made it home in good time with said children in fairly high spirits. Poor Jen was wedged between a two car seats in the back of my Pilot which - all I can say - is a testimony to how SKINNY she is 'cause there just wasn't a whole lot of room back there folks! Don't let the girl fool you - she is S_K_I_N_N_Y!! Monday through Wednesday were 100 yard dashes every day including a day at the Houston Galleria getting Picture People photos (THANKS Omar for not only working us in but also taking some of the BEST photos we've had of the boys in quite some time! ), waiting in the interminable line at the Apple Store for yours truly to get her new iPhone, finding out that the promised and highly anticipated trip to Pottery Barn Kids would have to be postponed since they closed their Galleria store (Ben was NOT happy...) and tons of other stuff. Mike headed off for Kazakhstan on Thursday while we were trying to head back up here. Problem is, you need KEYS for that little adventure to really get off the ground. Up at dawn, car packed early, kids in seats, and who can't find her keys? Panic and think perhaps Mike has them by mistake. But no, not the case. Turn house upside down. Look in car and under seats. Check obscure-but-have-found-them-here-in-the-past places. Nadda. I find the key (sans remote) that came with the car and proceed to get to the kennel at least (dogs do not fit in cars with tons of luggage and toddlers and babies and mamas...) before heading to Mike's office to get HIS car key. Decide to check house ONE MORE TIME in case I missed something. Nothing found. Decide to just unload back of car and see if perhaps I was stupid enough to have left them in there while I was packing and they are completely covered by luggage. On the road finally - after THREE hour delay. Seriously, I am NOT trying to keep up the airlines. Besides, I offer Starbucks drinks on MY "flights", not peanuts. Good trip up considering I only slept 3 hours previous night, 3 hour departure delay due to key loss crisis. Enough of that Starbucks and you'll buzz yourself just about anywhere. Then I spend Friday and today working at Mike's folks house. They have moved into a seniors community after living over 20 years in the same house - a feat that Mike and I have never done with our frequent moves due to his job. Let's just say it's been a challenge to get what they need in their new place separated from what will be sold or thrown away. They are spending the night there tonight - the movers got the stuff delivered this afternoon and Mike's sister and hubby and I worked our tails off getting it set up, unpacked, placed, etc. Not all pictures up yet but I hope to get those done tomorrow. It's made me REALLY think about what MY kids will have to contend with possibly someday so have resolved to get everything sorted and in order before too long. And folks, check on those meds expiration dates frequently. PLEASE. So it's 11:30pm, I should be in bed but instead I blog. I'm gonna regret this in the morning. But seven days without blogging is just rude. And frustrating.